[following the article on Porphry] Somewhat later than Porphyry, the name of Julian (331-363), the Roman emperor, may here be fitly introduced. During his brief reign of sixteen months he proved himself, if not always a judicious, yet a sincere and earnest reformer of abuses of various kinds, and he may claim to be one of the very few virtuous princes, pagan or christian. Unfortunately the blame attaching to his ill-judged attempt to suppress the religion of Constantine, from whose family his relatives and himself had suffered the greatest injury and insult, has enabled the lovers of party rather than of truth to conceal from view his undoubted merits. "In one and the same day he gave audience to several anbassadors, and wrote or dictated a greta number of letters to his generals, his civil magistrates, his private friends, and the different cities of his dominions. He listened to the memorials which had been received, considered the subject of the petitions, and signified his intentions, more rapidly than they could be taken in hsorthand by the diligence of his secretaries. He possessed such flexibility of thought, and such firmness of attention, that he could employ his hand to write, his ear to listen, andhis voice to dictate, and pursue at once three several trains of ideas without hesitation and without error. While his ministers reposed, the prince flew with agility from one labour to another, and after a hasty dinner, retired into his library till the public business which he had appointed for the evening, summoned him to interrupt the prosecution of his studies. The supper of the emperor was still less substantial than the former meal; his sleep was never clouded by the fumes of indigestion . . . He was soon awakened by the entrance of fresh secretaries who had slept the preceeding day, and his servants were obliged to wait alternately, while their idefatigable master allowed himself scarcely any other refreshment than the change of occupation. The predecessors of Julian, his uncle, his brother, and his cousin, indulged their purile taste for the games of the circus under the specious pretence of complying with the inclination of the people, and they frequently remain ed the greater part of the day as idle spectators . . . On solemn festivals Julian, who felt and professed an unfashionable dislike to these frivolous amusements, condescended to appear in the Circus, and, after bestowing a careless glance on fice or six of the races, he hastily withdrew with the impatience of a philosopher who considered every moment as lost that was not devoted to the advantage of the public, or the improvement of his own mind. 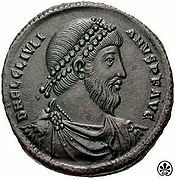 By this avarice of time he seemed to protract the short duration of his reign, and, if the dates were less securely ascertained, we should refuse to beleive that only sixteen months elapsed between the death of Constantius and the departure of his successor for the Persian was in which he perished." Following the principles of Platonism, "he justly concluded that the man who presumes to reign should aspire to the perfection of the divine nature - that he should purify his sould from her mortal and terrestrial part - that he should extinguish his appetites, enlighten his understanding, regulate his passions, and subdue the wild beast which, according to the lively metaphor of Aristole, seldom fails to ascend the throne of a despot." With all these virtues, unfortunately for his credit as a philosopher and humanitarian, the imperial state Stoic allowed his natural goodness of heart to be corrupted by superstition and fanaticism. Conceiving himself to be the special and chosen instrument of the Deity for the restoration of the fallen religion, which he regarded as the true faith, he made it the foremost object of his pious but misdirected ambition to re-establish its sumptuous temples, preisthoods, and sacrificial altars with all their imposing ritual, and "he was heard to declare, with the enthusiasm of a missionary, that if he could render each individual richer than Midas and every city greater than Babylon, he should not esteem himself the benefactor of mankind, unless at the same time he could reclaim his subjects from their impious revolt against the immortal gods." (2) Inspired by this religious zeal, he forgot the maxims of his master, Plato, so far as to rival, if not sirpass, the ancient Jewish or Pagan ritual in the number of sacrificial victims offered up in the name of religion and of the Deity, Happily for the future of the world, the fanatical piety of this youthful champion of the religion of Homer proved ineffectual to turn back the slow onward march of the Western mind, through fearful mazes of evil and error indeed, towards the "diviner day" which is yet to dawn for the Earth. Gibbon, Decline and Fall of the Roman Empire, xxii. The philosophical fable of Julian - The Caesars - has been pronounced by the same historian as "one of the most agreeable and instructive productions of ancient wit." Its purpose is to estimate themerits or demerits of the various Emperors from Augustis to Constantine. As for the Enemy of the Beard, it may be ranked, for sarcastic wit, almost with the Jupiter in Tragedy of Lucian.